The College of Tropical Agriculture and Human Resources has named a new anthurium in celebration of the university's 100th anniversary. The dual-purpose cut flower and potted plant selection is named "Centennial." University of Hawaii scientists have created a new type of anthurium and named it "Centennial" in honor of UH's 100th anniversary. 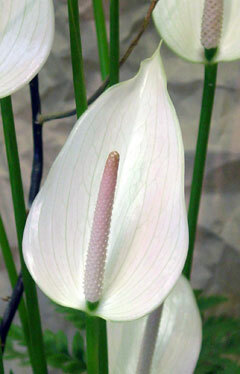 Researchers at the College of Tropical Agriculture and Human Resources, the first college at the university, developed the anthurium. The plant commemorates a century of educational achievements that began with the study of the agricultural sciences, according to a UH news release. "We're very pleased that we can celebrate the college's and university's centennial with this beautiful anthurium, and at the same time create a new future product for Hawaii's anthurium growers," said Andrew Hashimoto, the college's dean. The Centennial anthurium is a little less than 5 inches long, 2.5 inches wide, and is white with green stripes, the same as UH's colors. Researchers describe the green stripes that come together as a symbol of the diverse cultures present at the university. The tip will turn pink if grown in cooler temperatures, according to the news release. Professor emeritus Haruyuki Kamemoto, Heidi Kuehnle, Tessie Amore, John Kunisaki, Joanne Lichty and Janice Uchida teamed up to develop "Centennial." Kamemoto is credited with establishing UH's anthurium research program in 1950 to develop disease-resistant and novel varieties for the flower industry. The program has released more than 40 new commercial varieties since 1963, helping make anthuriums the state's most valuable cut-flower crop. Cut anthuriums had a farm value of $4.7 million in 2005, according to the university. "Centennial" yields about six flowers per plant a year and is expected to be commercially available in a few years, the university said.